I spent most of my childhood wishing I was someone else. Not any particular or specific someone, just anyone other than who I really was. And it wasn’t that I didn’t like myself, I merely didn’t like the skin I was in. My skin was flawed and full of faults, blemished beyond repair, and basically bad – through and through. You see, I was freckled and speckled and spotted with dots. I was covered in kisses from the Sun. My arms and legs and my back and shoulders were generously speckled and to some degree, still are. I tried to count the freckles on the back of my hand once, but there were so many of them that I simply decided there were at least one hundred, or perhaps one thousand and although I’m sure there was not that many, there was no area where I could place my finger and not touch one. I would eye the other girls at school with their perfect creamy skin and fantasise about my freckles joining up one day. I was too young to realise that was never going to happen, but I believed if they did, I would have the healthy glow of a sun-baked goddess. Of course, days spent worshipping the Sun only provided it with more opportunities to continue to discolour my skin in specific places, and not all over. My face, my biggest mortification, was covered in (what I considered to be) large, bright, multicoloured spots. They were sprinkled everywhere – across my nose, over my forehead, down my neck and they even ringed my lips. 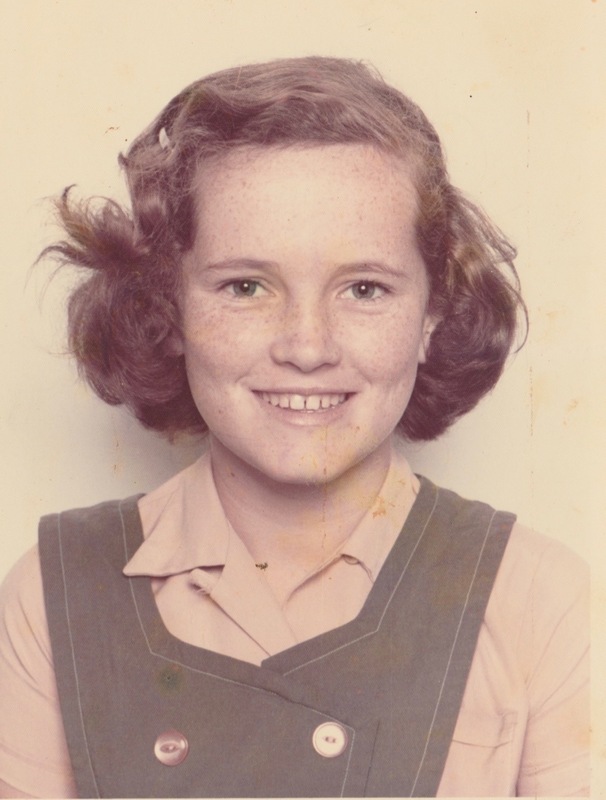 My Grade 6 Photo – although most spots on my face have faded, I still have that dot on the right side of my neck. Some were brown, others a slightly darker shade. Some were lighter, almost orange, and if I looked close enough I could see some were white. I used to call them my ‘reverse freckles’ and often wondered if they would join up and overthrow their darker cousins. Obviously, this never happened either though I also thought if I stayed out of the Sun altogether, my freckles would pale into insignificance and completely disappear. Ah, the wonders of a child’s mind, but again, that was something that never happened. All I ever wanted was perfect, blemish-free skin and it astounds me that these days it’s a trend to have freckles tattooed on. (Click here to read/see more.) It’s been going on for a few years now – WOW! I wonder which (slightly) speckled celebrity started this trend? These days, I look at my arms and they reflect back at me the arms that belonged to my mother. As a redhead, she may not have gifted me her hair colour, but she certainly gifted me her pale sensitive skin. Let’s not forget that pale skin + freckles = higher risk of developing skin cancer. By the time she was in her 40’s, my mother had had many treatments on spots that were ‘not quite right’ and although I had mousy-brown hair, I still had her skin. By the time I reached my late teens, I had started avoiding exposure to the Sun during the hottest, and most dangerous, times of the day. These days we have the wonders of modern technology to warn us about the ultraviolet (UV) index. The weather app I use indicates that yesterday that the UV index was extreme between 10:00 am and 1:00 pm, but high from 9:00 am to 3:00 pm. Thirty years ago (ok, a little more than 30 years ago), it was not just my mind telling me to stay out of the Sun – there was the original, and highly successful, Slip, Slop, Slap campaign that grounded my own beliefs to avoid those times of the day. This was a time when melanoma rates in Australia were climbing and evidence of a link between UV radiation and skin cancer was mounting. Sid the Seagull had a strong message – slip on a shirt, slop on some sunscreen, and slap on a hat. The Slip! Slop! Slap! slogan became the core message of the Cancer Council’s SunSmart program and played a key role in altering people’s attitudes toward sun exposure over the last four decades. The campaign certainly worked on me and, as a young mother, some of my friends thought I was crazy because I would keep our girls inside during the hottest part of the day. Who’s crazy now? I would limit their exposure because I could see their skin was just like mine – ok, one daughter inherited her dad’s olive skin, but the other two inherited the pale, sensitive skin I had inherited from my mother – skin that burns and freckles easily, skin that more readily develops cancer. I didn’t have any control over my sun exposure when I was young, but I do now, and although it took me a long time to realise those endless ‘Kisses from the Sun’ are more than skin deep, they are only a minor part of who I am, and a constant reminder to be aware and vigilant when it comes to being exposed to the Sun’s harsh rays. Slop on SPF 30 or higher broad-spectrum, water-resistant sunscreen*. See the current TV campaign ad here. * at least 20 minutes before sun exposure. Reapply every two hours when outdoors or more often if perspiring or swimming. I used to be red headed, but now it’s mostly grey. I never had the fair skin though. I fell in love many times with fair skinned red haired girls when I was younger. I’m glad that I inspired you to write this piece. It’s spectacular and I love it! Thank you. Thank you for inspiring me though I did work on this a little longer than initially intended. I will be back for regular inspiration. And as for my mousy-brown hair, these days it’s blond to hide all the grays. We never were told to stay out of the sun when I was little. It just was nothing anyone talked about! But when I started having children I started noticing wrinkles and have pretty much stayed out of it and if I am in it I wear sunscreen. By the way, I loved your freckles. 😊😊😊 I hated them, but I’m over that now. As for sunscreen, I can’t wear most brands because they burn my skin on application. So for me it’s cover up or stay out of the sun. I love that I have yours and Nanas sensitive skin, Mama Bear. Thank you for keeping me out of the sun when I was little!